I had plans to head to a friend’s house with my sister and her kid to watch the Superbowl on Sunday. Unrelatedly, I decided to do some grocery shopping on Saturday—a terrible mistake. Stores were overcrowded! But while I was out I decided to pick up a box of cake mix so that I could whip up something fun for the event. 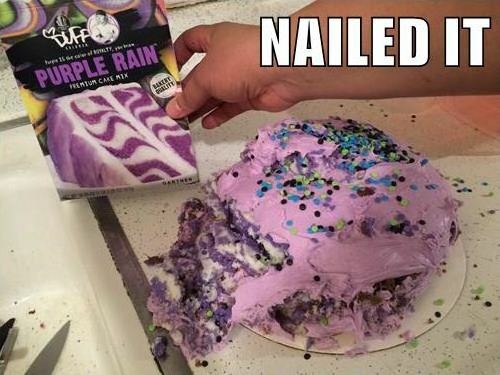 I picked a lovely purple swirly cake and purple frosting. Why not? I was sure the kid was going to love it. So on Saturday night, after finishing my outside errands in the frenzied crowds then coming home and tiredly cooking my meals for the week, I decided to get that cake baking over with. Baking is usually a fun and relaxing activity for me, and I generally enjoy making pretty cakes for special occasions. This was my first time with a cake batter swirl pattern, so I was excited to see the finished product. But this one didn’t come out the way I thought it would. 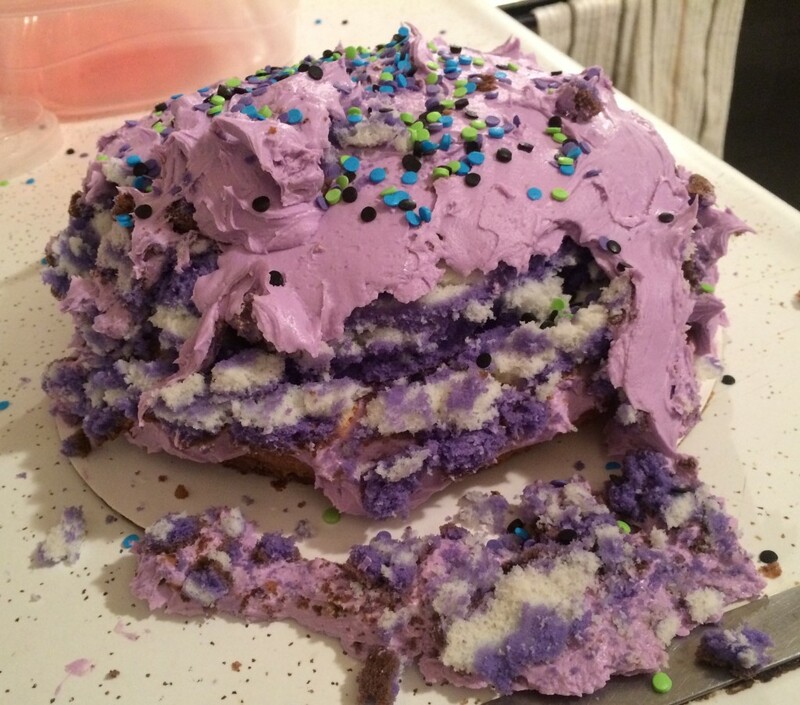 As I was frosting the cake, the sides…well, they just started separating off and falling apart. 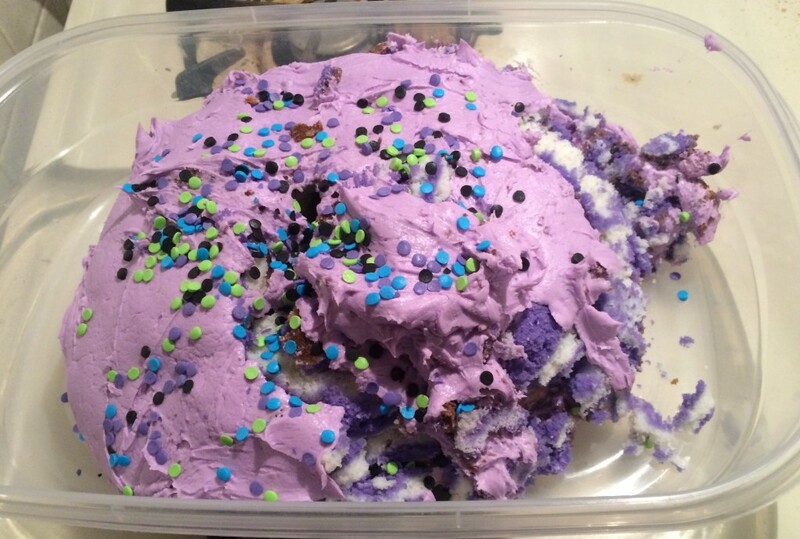 I thought maybe my frosting was too thick so I tried applying it more carefully and fixing up the chunks that were falling to the side, but nope! The frosting’s weight pulled new pieces off. Eventually, I lost that big chunk on the left. It just…cracked…then slowly…flopped over. After wiping the laughter-tears from our eyes and snapping a few more pictures (never forget! ), we shoved the mess into a Tupperware and called it a night. The fact that this three year old didn’t judge my fail-cake made me feel surprisingly better about screwing up a box cake. It also helps that it’s still delicious! Some day I’ll have to try this mix again to figure out what went amiss.